The number of New York City police officers killed as a result of the September 11, 2001 attack continues to rise, thirteen years after the fact. The New York Police Department website has a memorial page which honors the victims of 9/11/01. The page notes "Twenty-three New York City Police Officers died in the line of duty on September 11, 2001 as they responded to the terrorist attack on the World Trade Center." However, the department also notes more than 50 others who died as a result of the environmental hazards. Since our last article on this in 2013, five more names have been added to the NYPD dead. Officers with mental disabilities, however, have a tougher case to prove. Over 70 New York police officers were arrested earlier this year after being accused of having "exaggerated their psychological trauma" experienced as a result of the 9/11 attacks. Police in New York also arrested many people that day under suspicion for involvement in the 9/11 attacks, all Israeli citizens; yet this is not a fact widely known by the general public. ["Dancing Israelis" Arrested On 9/11 Later Sued The Govt, But Lost Their Case (Featured on Infowars,com.)] Please see our additional links below for documented proof of what really happened on 9/11/01. "The following members of the service have perished since as a result of illnesses contracted from exposure at Ground Zero and Fresh Kills. "Evidence linking these Israelis to 9/11 is classified. I cannot tell you about evidence that has been gathered. It's classified information." -- US official quoted in Carl Cameron's Fox News report on the Israeli spy ring and its connections to 9-11. The job of a shaped charge is to cut steel H-beams. 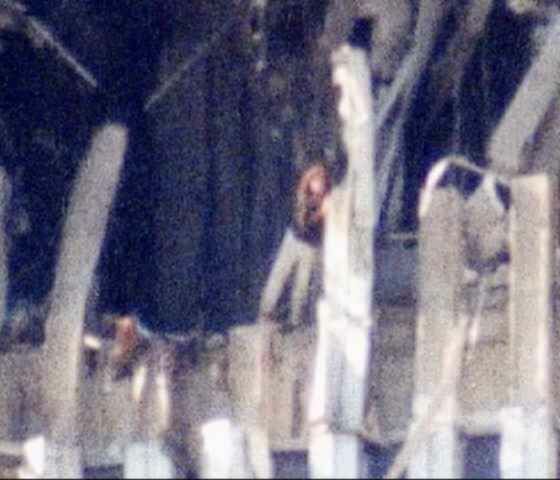 "The way we do this is by cutting the beam at an angle which through a series of beams cut at the same angle will tend to make the building shift over and 'walk'"
Take a close look at the manner in which WTC 7 collapses straight down. For the building to collapse in this fashion, all of the load bearing supports would have had to fail at exactly the same time. The claim that the collapse was the result of a fire requires the fire be equally distributed throughout the entire floor of the building, providing equal heat for an equal amount of time, so that all the load bearings members would fail at the exact same moment. Do you find this plausible? BBC reported the collapse of WTC building 7, 26 minutes before it happened! At 21:54 GMT on 9/11/2001 the BBC announced that WTC 7 had collapsed. 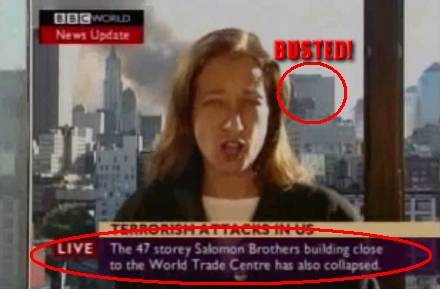 There was just one problem with this news: WTC 7 did not collapse until 22:20 GMT. 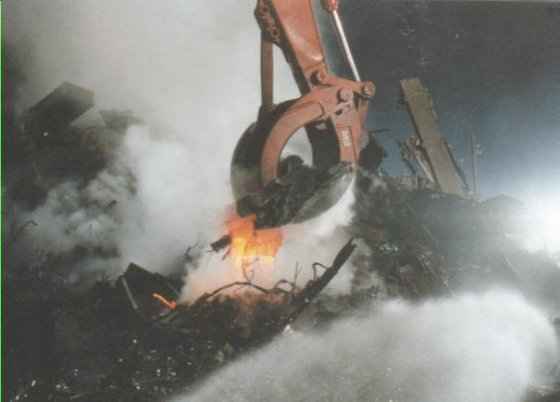 The official story is that there was a raging inferno at the impact point, which is why the fires were able to melt the steel. But almost all of the jet fuel burned outside the building, producing the huge orange fireballs, and as this photo shows, temperatures at the impact point were low enough to allow people still inside the building to peek out. Why was the temperature at the core of "the pile" nearly 500° F hotter than the maximum burning temperature of jet fuel a full seven days after the collapses? There were no infernos in either of the twin towers before they collapsed, so what caused the hot spots deep in their wreckage? Kenney: "We're currently one of the first teams that was deployed to support the city of New York for this disaster. We arrived on late Monday night, and went into action on Tuesday morning. And not until today did we get a full opportunity to work the entire site." The following members of the service died in the line of duty on September 11th, 2001. Twenty-three New York City Police Officers died in the line of duty on September 11, 2001 as they responded to the terrorist attack on the World Trade Center. The commands that lost members that day included the Emergency Service Unit, Squads 1, 2, 3, 4, 7, 8 and 10; the 6, 13 and 40 Precincts; the Bomb Squad; Transit Bureau District 4; Traffic Control Division; and the Police Academy Video Production Unit. COPS ARE UNDER NO OBLIGATION TO PROTECT ANYONE. Bruce Leichty, a California attorney who represented 9/11 widow Ellen Mariani in federal litigation between 2007 and 2013, is hosting a 9/11 event in Southern California on September 13th. Christopher Bollyn, author of Solving 9/11: The Deception That Changed The World, will speak at the free event in San Dimas. The event is open to the public. Bollyn will also speak at an event in Oakland on September 11th and in San Diego on Sept. 14.